What is a mini session? Mini sessions are short and sweet photo shoots (~45 minutes). It is a wonderful way to capture of a few great moments with your child and family as an alternative to a full custom session that requires more time and investment. When are the mini sessions being held? 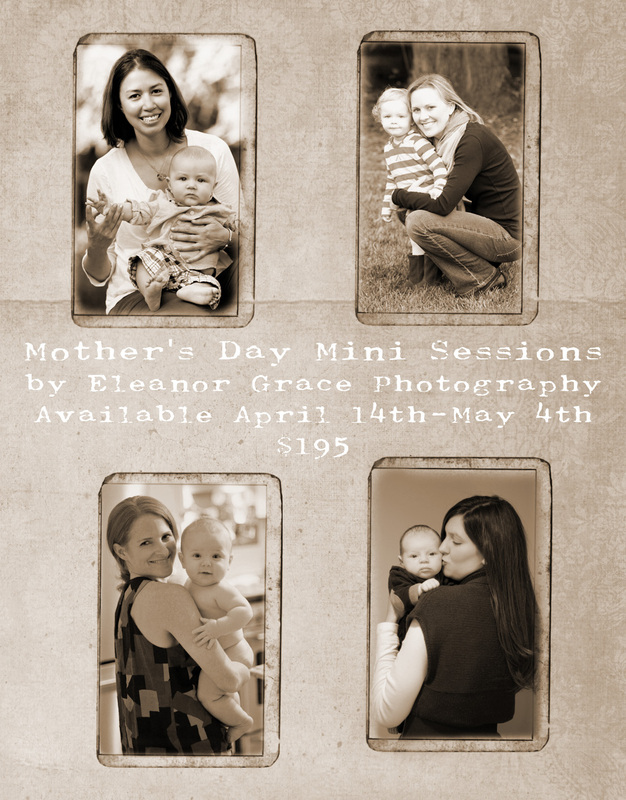 Eleanor Grace Photography will be conducting special “Mommy & Me” mini sessions from Wednesday, April 13th until Wednesday, May 4th, 2011. What do you get? This year’s “Mommy & Me” mini sessions include a 45-minute on-location photo session, one 5×7 print of your favorite image, a high-resolution file of that print (sent right to your inbox!) and 10% off additional a la carte items. You will receive a link to a private online gallery where you can view your finished images (typically 10-15 images for a mini session) so you can select your prints. Hey Dads! This is a great gift idea! HINT! HINT! A Mommy & Me mini photo session is a fabulous gift idea! If you want your baby mama to think you are a rockstar this year book a session for her! Just as great – buy a gift certificate for her to use after Mother’s Day. 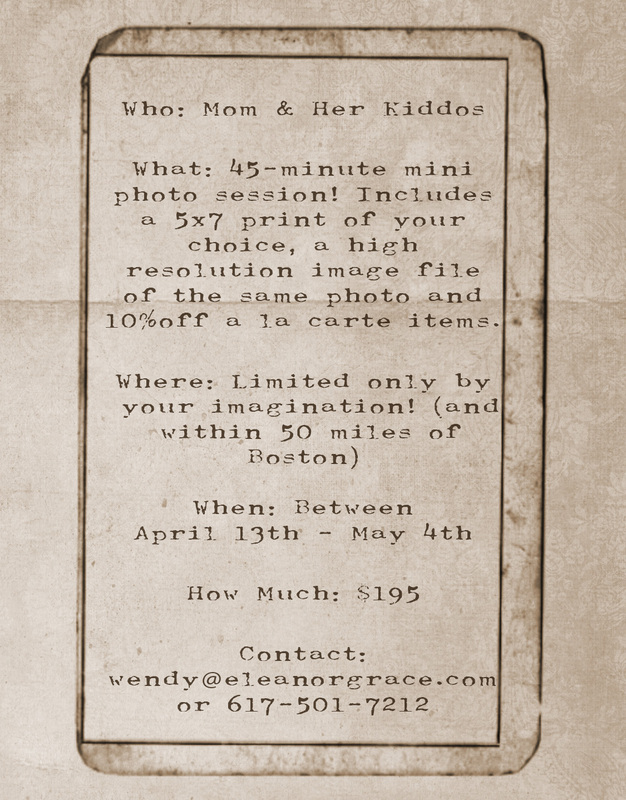 The fine print: The Mommy & Me mini session package is priced at $195. Since this is for Mom, she needs to be in all of the pictures! This is also a great opportunity for maternity photos as well. All sessions are by appointment only. Payment is due prior to shooting. No additional session fee. No minimum order. Additional prints, canvases, albums and high-resolution digital negatives are available for purchase as add-ons. This offer is only good until May 4th, 2011.